A prosthetic ear artificially restores the ear which has been lost due to radical cancer surgery, amputation, burns, ear reconstructive surgery and/or congenital defects. The delicate structures remaining after surgery are covered by thin, highly sensitive skin and this soft, very fragile tissue must be kept free from irritation and debris from the environment. The function of the prosthetic ear shape is to direct sound waves into the auditory canal and to maintain a proper environment for the inner ear membranes. It normally improves hearing by about 20%. The prosthetic ear will retain eyeglasses and retain a hearing aid if needed. It also serves as a great psychological benefit in the rehabilitation of the patient's social, physical and mental well-being. Select one of the links below to view images of an ear prosthesis created as a result of the situation or condition identified. 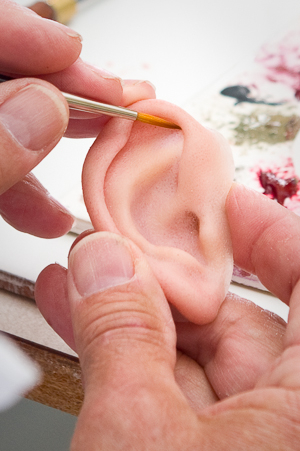 Click here to learn more about ear prosthesis vs. ear reconstructive surgery!